During the great depression, financial problems were not the only trouble the Manhattan Beach community faced. The gravity of the Depression was dramatized more by such events as the suicide of Charles Avey, who was the agent for the Manhattan Beach Development Company and one of the city's leading citizens. The fortune of the development company had begun to decline even before the stock market crash. His suicide was attributed to financial difficulties and domestic troubles. Avey's death may have been one of the earliest Depression-related suicides in the city but it was by no means the only one. Means of self-destruction ranged from ant poison to jumping off the pier. While the Depression was being felt in many different ways throughout the city, road construction was probably least affected by the Depression. The American people's love affair with the automobile in the 1920's had stirred a broad-based demand both nationally and at the state level for better roads. The largest project in Manhattan Beach at this time was the paving of Sepulveda Boulevard, formerly rough, eucalyptus-lined Camino Real. In 1930, work moved rapidly on the sub-grading. 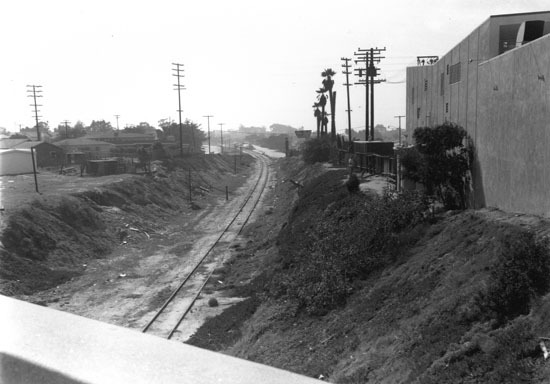 Three steam shovels began cutting through the hill at the intersection of Sepulveda and the Santa Fe Railroad tracks. Bulldozers moved huge quantities of dirt to raise the level of the grade separation at the tracks. Prior to the grade separation the road went across the railroad tracks. Cement piers which supported the bridge over the tracks near Valley Drive and Sepulveda, were built by the State of California. On October 29th, bids for the remaining work were opened by the City and awarded to a local-construction company the "Kuhn Brothers." The company had secured the contract for the construction of the bridge, which called for approximately 1,200 yards of cement. Not everyone saw the roadwork as progress; there were several lawsuits against the city. One such suit was filed in April 1930, by Ora and Lena Schreider, seeking $1,500 for alleged 'damages to their property caused by the grading of Sepulveda that left their land 14 feet BELOW the street. It would not be until April 1931 that work was finished and the strip of road was open for travel. On October 20, 1932, the City Council adopted Ordinance 389, making the stretch of road from Rosecrans Avenue to our southerly boundary officially named "Sepulveda Boulevard." The big snag was getting the highway through El Segundo. At first the residents resisted, but with a 26 to 10 vote in a special election contingent upon county money, the idea was approved. Work began in November of 1933 by a crew of men employed by J.L. McLain, who had been awarded the paving contract. With the completion of the highway through EI Segundo on May 11, 1934, one could drive North without detouring at Rosecrans Avenue. With Sepulveda cut through, Manhattan Beach was now on the main North-South traffic artery system. There had been an effort in 1932, of making the City of Manhattan Beach the western-end of Interstate 60, which stretched sea to sea from Virginia Beach, Virginia to Southern California, however, the project never happened. As residents were seeing changes in the ability to move throughout the area, they were also seeing changes in governmental relief, recovery and reform, the "Three Rs" implement by the new president, Franklin D. Roosevelt. Initially, the most important of these for Manhattan Beach and virtually every other community in America was relief. At the beginning direct cash relief and distribution of surplus food took precedence, however, later the emphasis was switched to work relief. Ultimately, going through such a major construction during the Depression was incredibly taxing on Manhattan Beach and its residents, but it ultimately proved to be a vital component to the development and growth of the city.